You've found the “U.S. 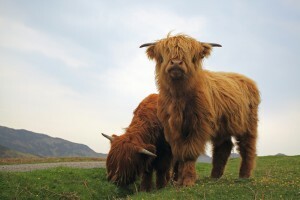 Scottish Highland Cattle Breeders” page here at Hobby Farm Wisdom! If this is the first time you have visited our site: Welcome! Originating in Scottland, the Highland cattle have long horns and long shaggy coats that can be black, brindle, red, yellow, or dun in color. The breed was formed mostly by natural selection which has resulted in keen survival instincts, hardiness, maternal abilities, efficient reproduction and longevity. Highland cattle thrive on rough forage and in cold, wet climates. The do not do well in high temperatures. Regardless, they will survive snow and harsh conditions being able to forage on steep mountains eating plants other cattle would avoid. They are mostly raised for their excellent quality of beef since it is low in cholesterol. Their milk has a high butterfat content making them good for milk and cheese production. Adult bulls can weigh up to 1,800 lbs and cows up to 1,100 lbs. Highland cattle can live up to 20 years and they can be used as house cows thanks to their good nature.